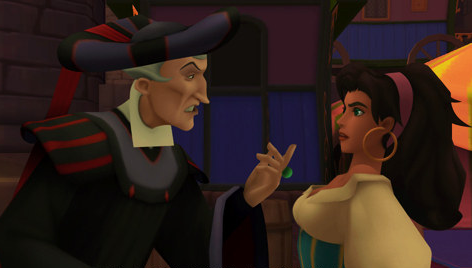 Let us re-address Kingdom Hearts 3D Dream Drop Distance and discuss Frollo’s voice. Part of the greatness Frollo is Tony Jay’s rich baritone. But who did they get to play Frollo for this game? The answer is Corey Burton. Burton is veteran voice actor but it is worth mentioning that Burton voiced the Brutish guard in the Disney movie. Which I find slightly amusing. But Burton doesn’t do a bad job as Frollo is it just different than Jay. Video of Frollo voiced by Burton. In Japanese, he is played by Shouzou Sasaki. Sasaki hasn’t lent his voice to much and it seems that this is his biggest role to date. – Jason Alexander and Charles Kimbrough were the only former cast members to reprise their roles. – Renee Faia appeared in an episode of Seinfeld which stared Jason Alexander. – Phil LaMarr is also a popular voice actor who was also on MADTv. – Hisako Kyouda oftens plays old ladies in anime.